Sad to say we don’t have a video of this song on Jbrary. You can find it on YouTube easily though, like this one described as a “gross kids song.” Why stop at one verse though? 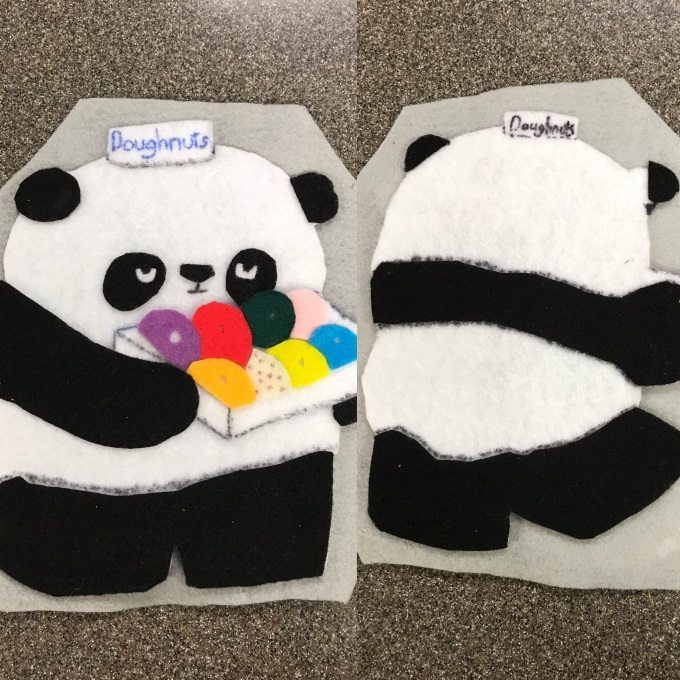 My co-worker Adam Smith wrote additional verses that Dana based her felt pieces on. 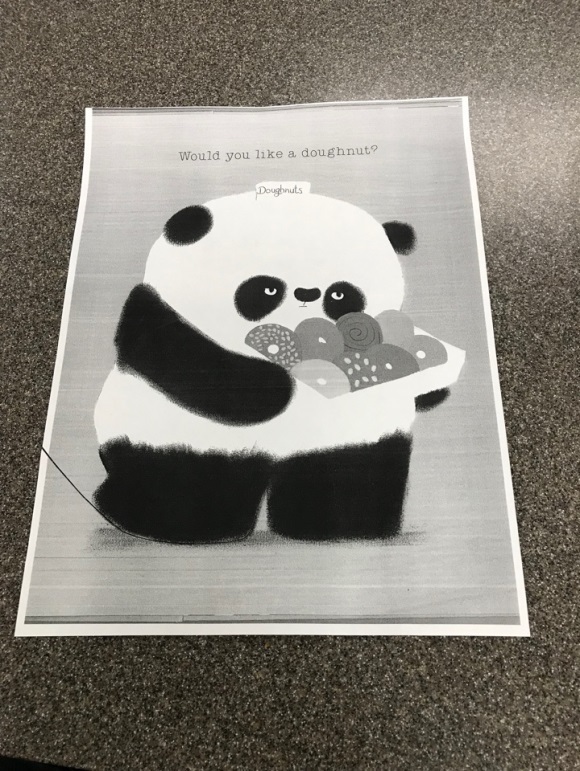 He’s given me permission to share them here. 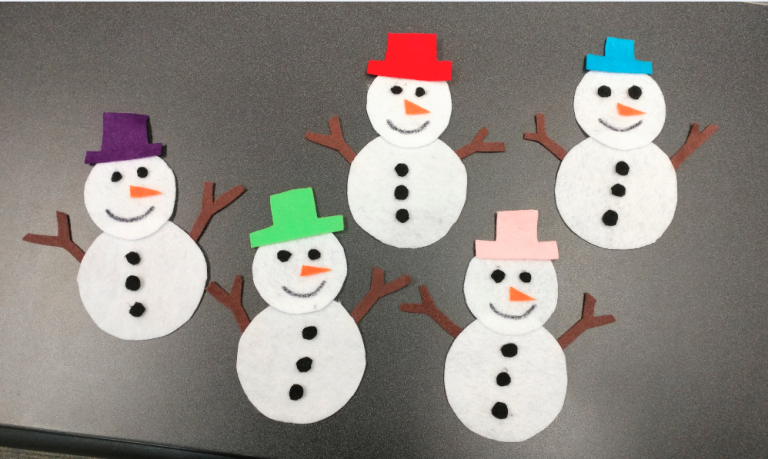 If you’ve got a silly preschool group or a K – 2 class visiting, you’ve got to try this out. Trust us. Can you think of any other verses? Hit me up in the comments with your rhyming geniusness. Guess who is participating in Flannel Friday this week!? I’ve had this flannel set for so long and recently started using it again. It’s been a total hit! I forgot how much the kids love to do this classic fingerplay with the extra verses. 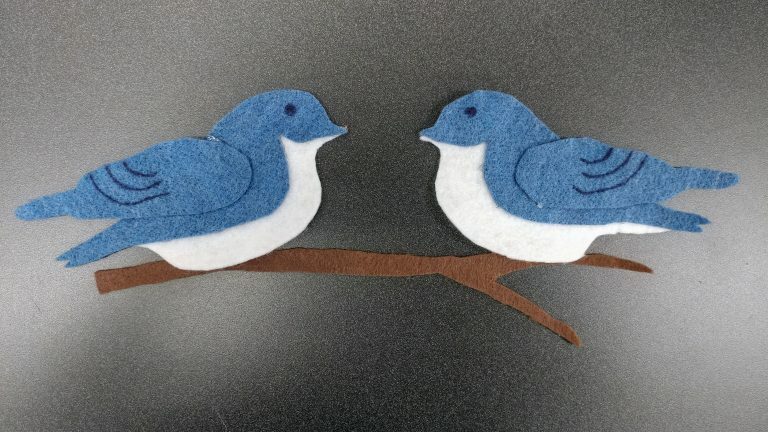 Because my felt board is black I made the birds blue so they would stick out more. 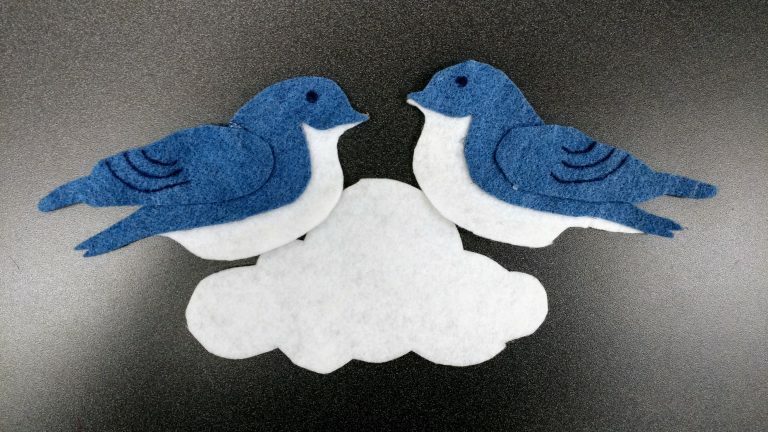 We sing, “Two little bluebirds…” Aren’t familiar with this rhyme or extra verses? Check out our video first! Then I ask where they should fly next. I let the kids direct the rhyme in that way. Here are the places we go. 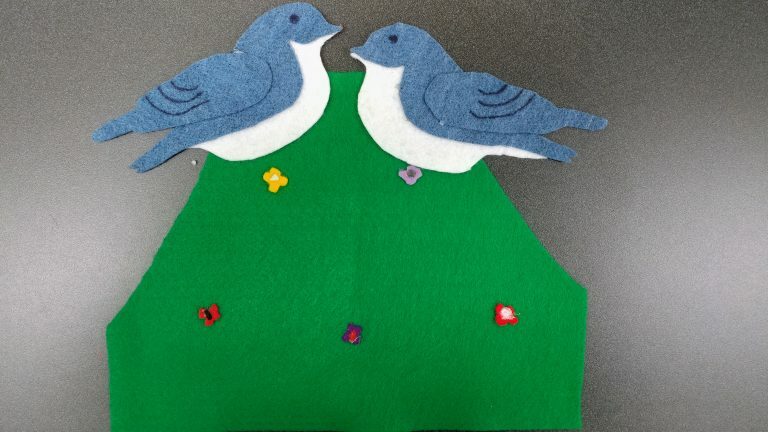 I’ve been using this one right after we read Hooray for Birds! by Lucy Cousins which is one of my 2017 Favourite Storytime Picture Books. Make sure to catch the entire Flannel Friday round-up here on Jbrary at the end of the week! 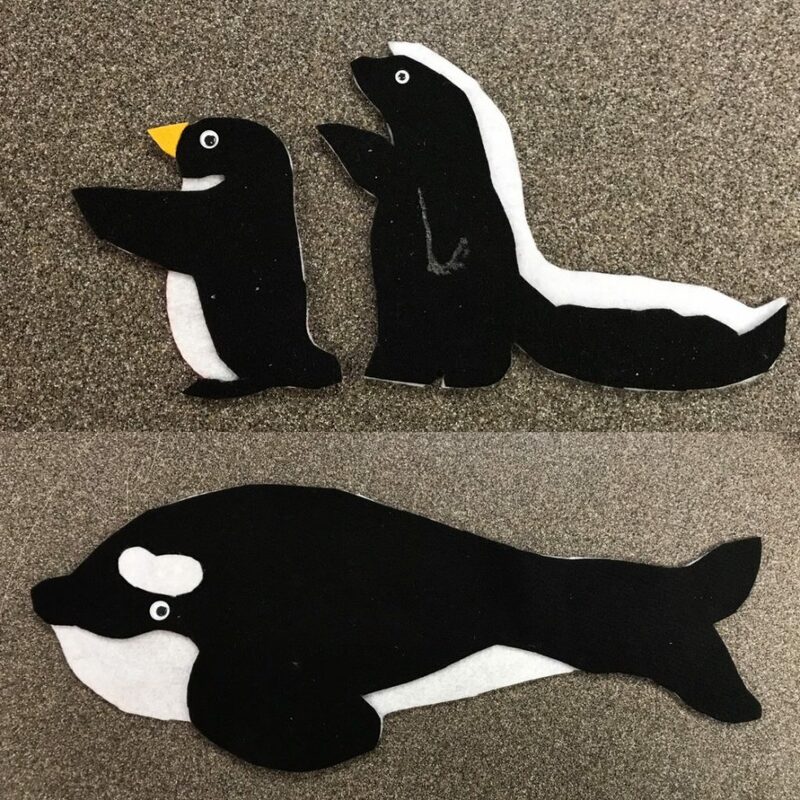 I love felt stories that can be used in multiple ways. 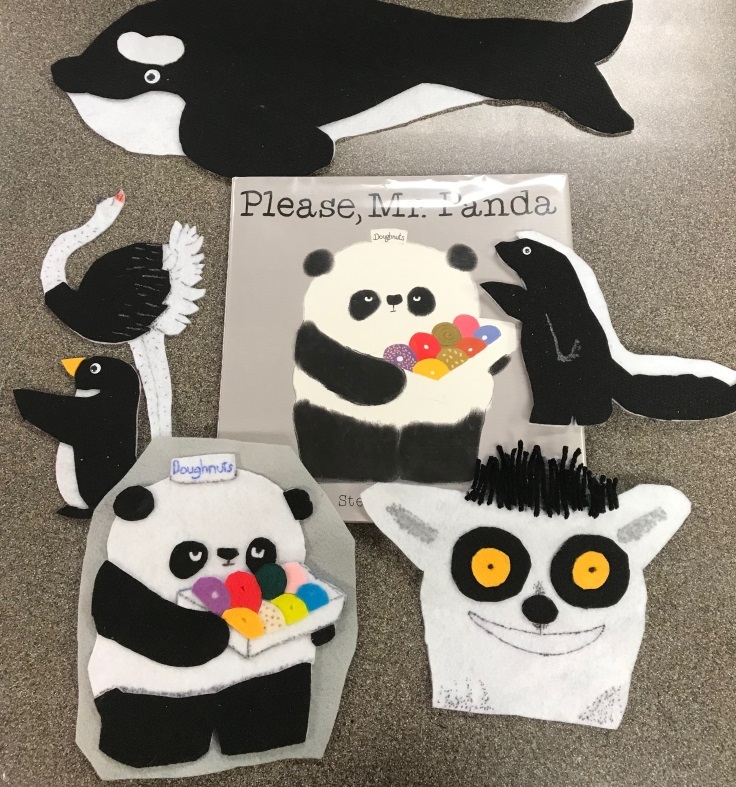 My Flannel Friday submission this week is courtesy of my SUPER AWESOME co-worker Kate Lowe who made this felt story and created the extension activities. 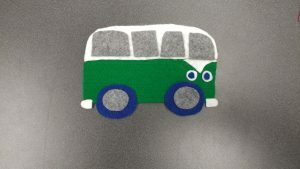 It is based on the picture book Toot Toot Beep Beep by Emma Garcia. 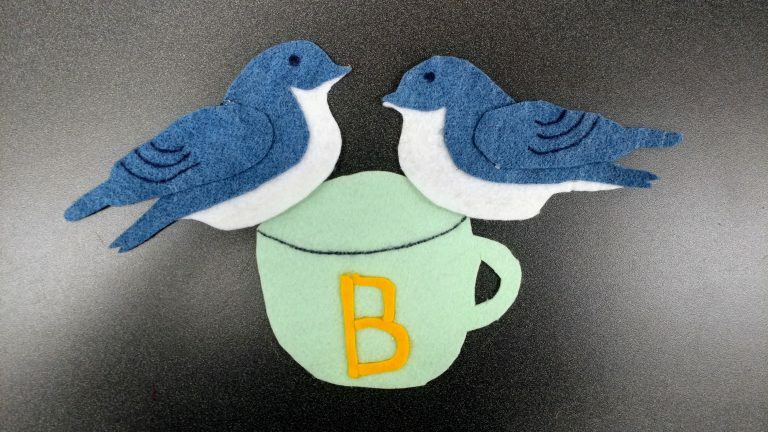 Thank you, Kate, for letting me borrow this felt story and for allowing me to share your genius on my blog! 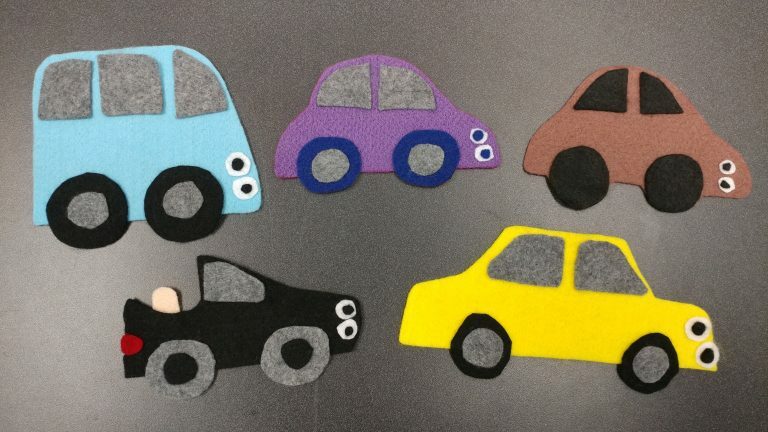 Here are the cars she created to retell Garcia’s picture book version. Kate said she added in a few extra cars to be able to do the extension activities. 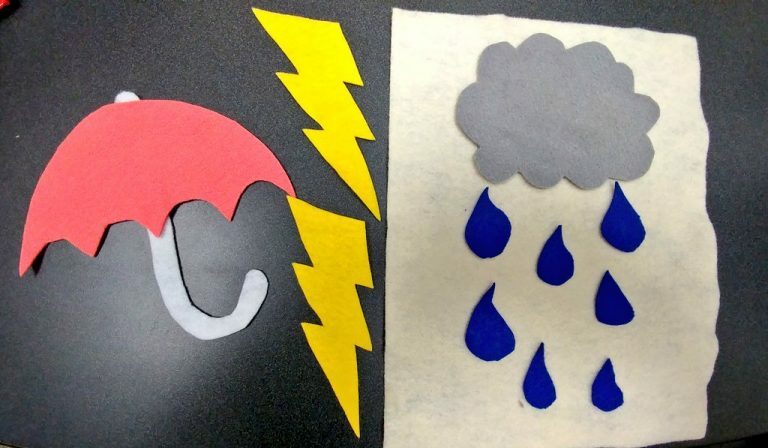 If you have a small group of storytimers, this is an excellent story to use to practice turn taking. 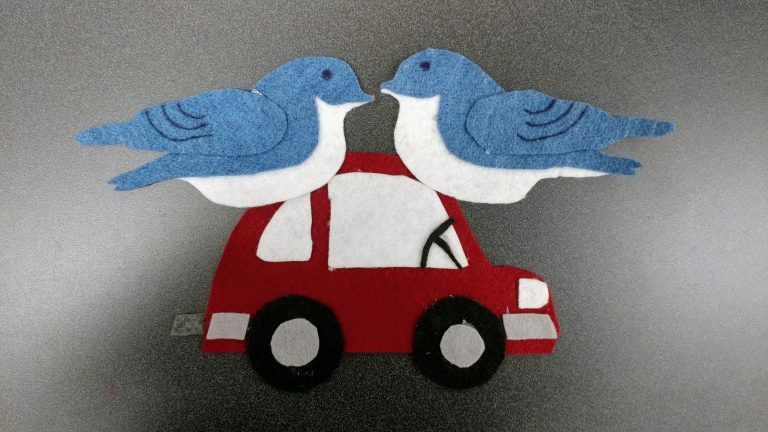 Give each child one of the cars and have them place it on the felt board as you tell the story. They could even be in charge of saying the sound associated with the vehicle. 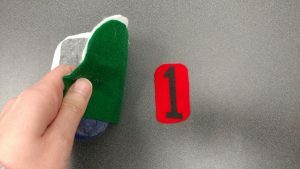 She also made a stop sign which can be used to practice letter recognition. Maybe follow it up with a fun stop sign rhyme! For the extension activities, Kate made a set of numbers 1- 9. Then she plays a “Little Mouse” type game where she asks the kids which car they think came in first place in the race. She uses this rhyme: Race cars, race cars, the race is done! Race cars, race cars, which car won? Then they lift each car up to reveal a number. The car with the number one is the winner! Want to practice colours? 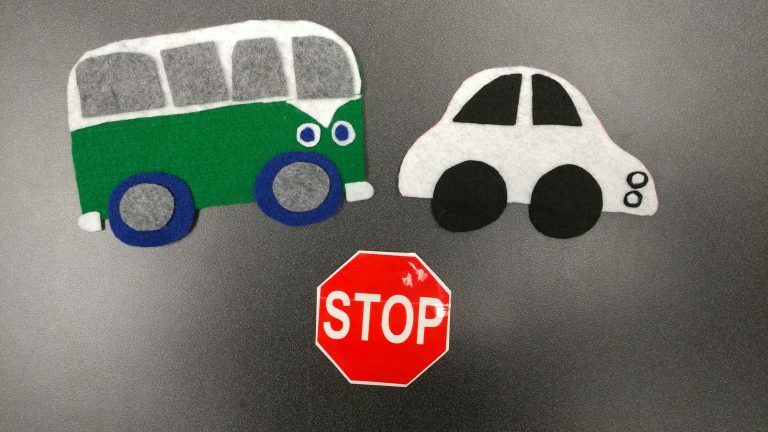 Kate came up with these two rhymes to help the kids identify the colour of each vehicle. Can you say what colour you are? There you have it! 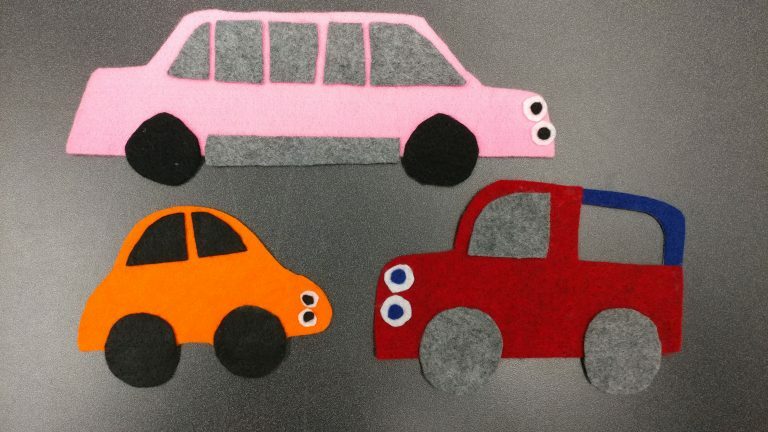 Three different ways to use these set of cars: to tell a story, to learn numbers, and to recognize colours. 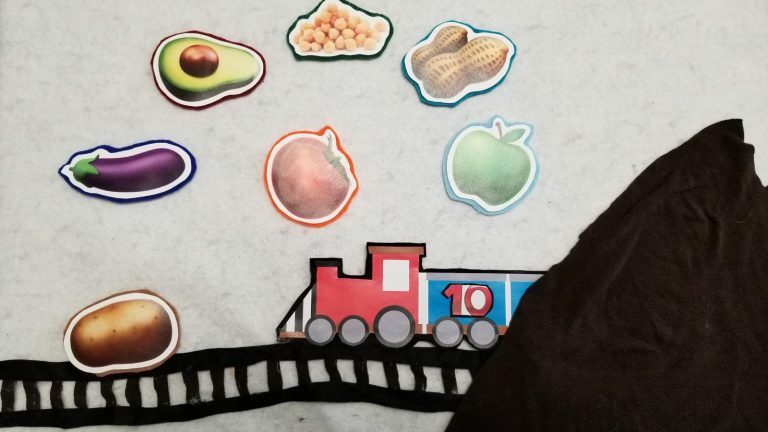 Thank you again to Kate for sharing her knowledge of early literacy and superb felt story making skills. And thank you to Jessica at Storytime in the Stacks for hosting this week’s Flannel Friday round-up! 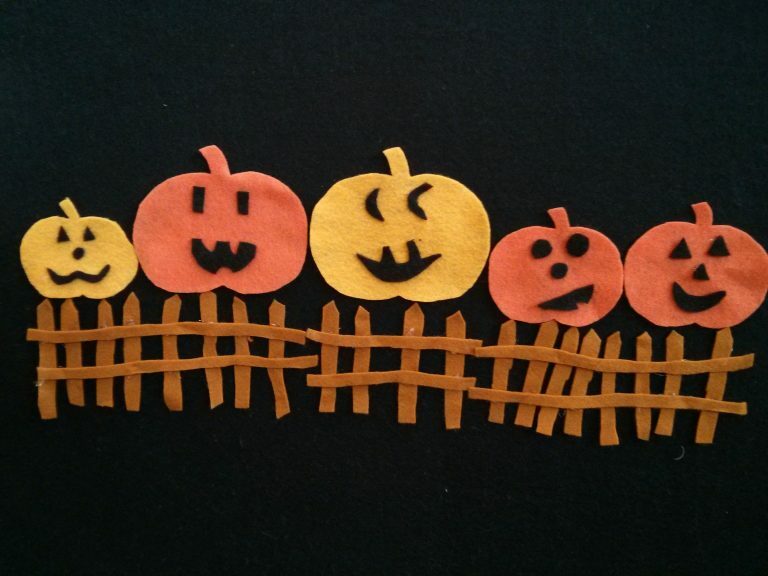 Last week I wrote about my favourite Halloween songs and rhymes. 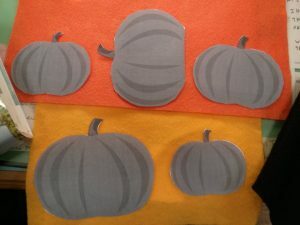 I recently stumbled upon the Pete the Cat book version of “5 Little Pumpkins” and decided it would be an easy enough felt story to make for a novice like myself . It’d also be great to help my toddlers visualize the rhyme as we count on our fingers. 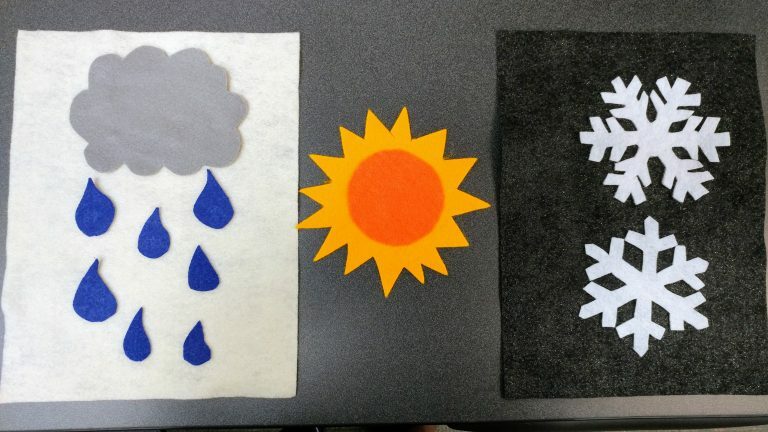 Lots of people have done a felt story version before – check out the Halloween board by Flannel Friday for more ideas. 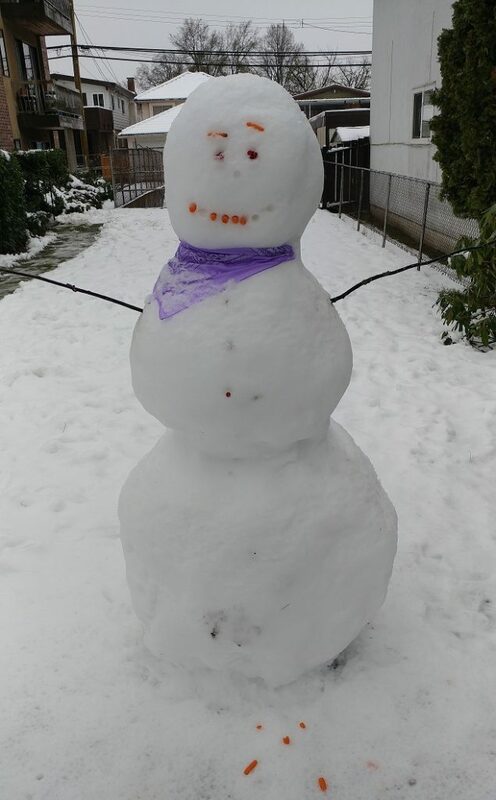 Here’s what I did! 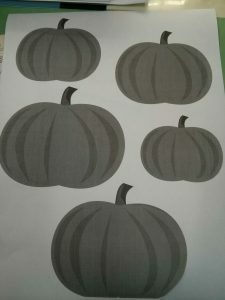 Step 1: Find clipart pictures of pumpkins and adjust them to different sizes. 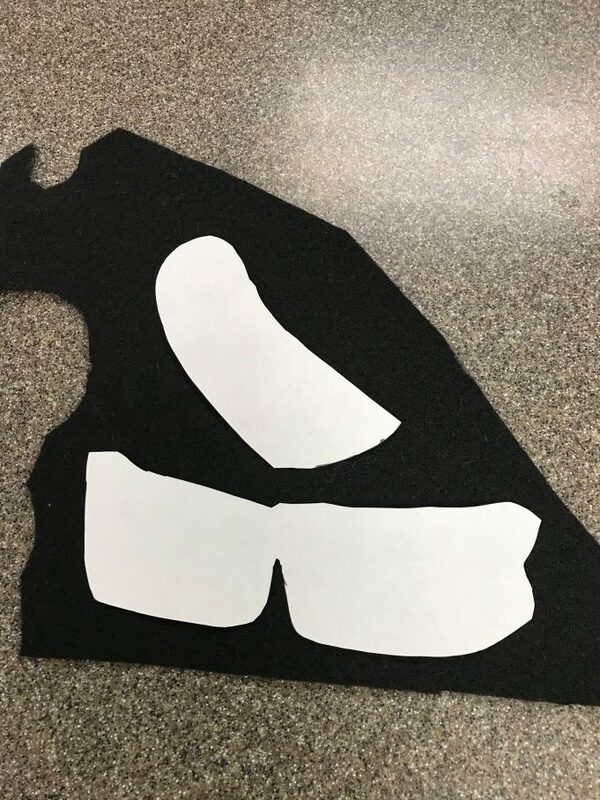 Print and cut out. 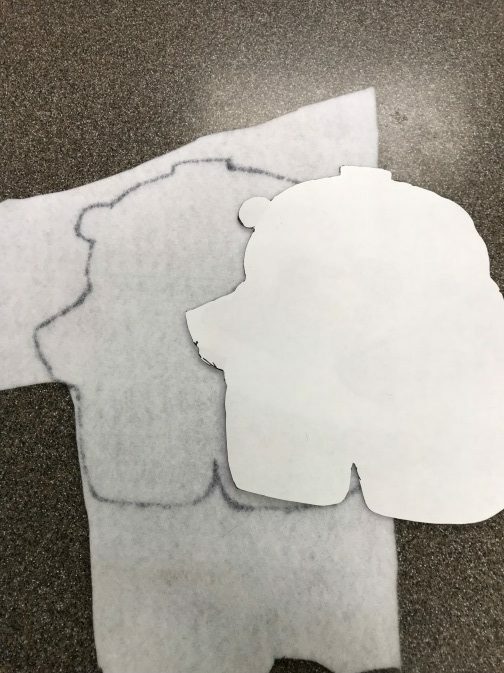 Step 2: Trace pumpkins onto felt. I used a pen. Cut out the pumpkins. I ran out of orange felt and had to add some yellow pumpkins. 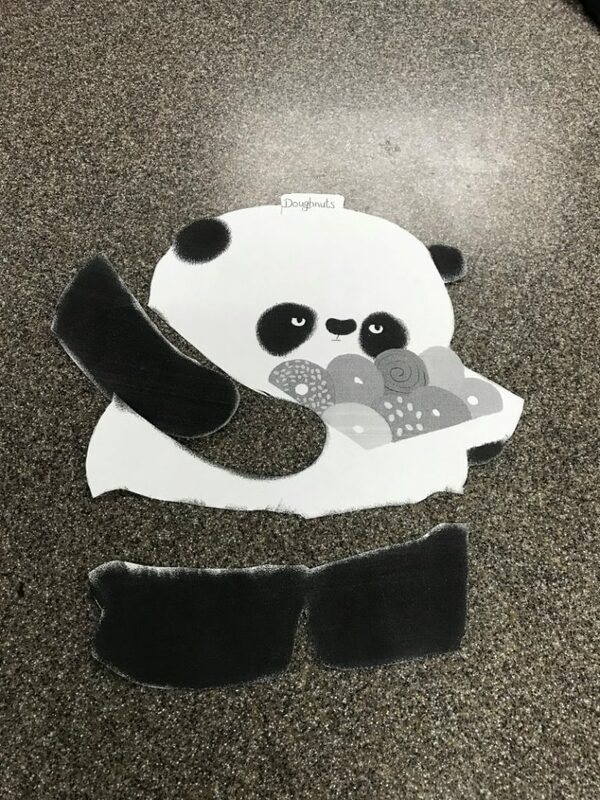 Step 3: Cut out all sorts of different shapes for the eyes, noses, and mouths. 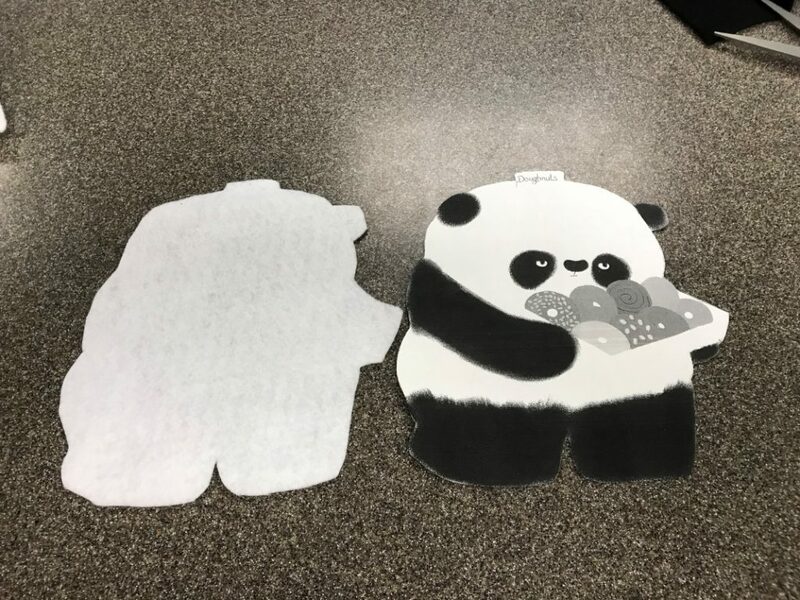 These pieces are tiny and can be tricky, but the kids will not care one bit if they are wonky. I promise. 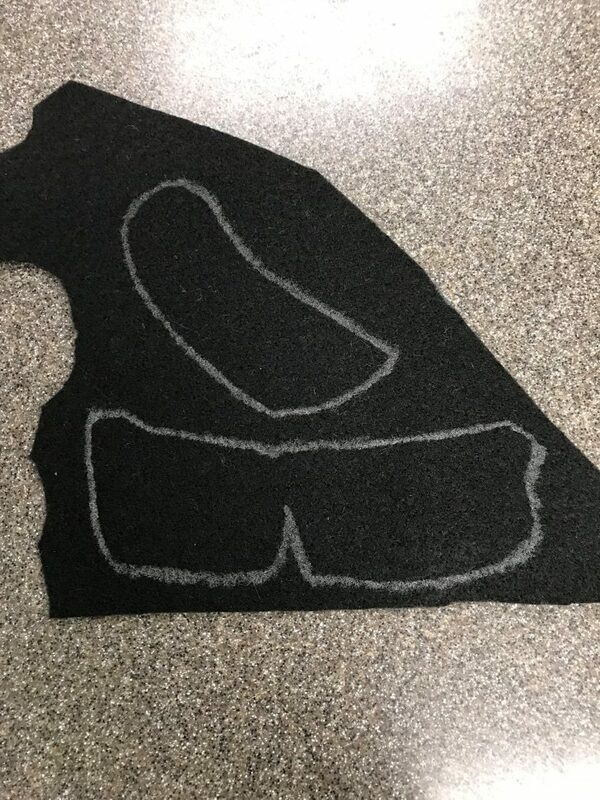 I used scraps of black felt for this part. Step 4: Cut out strips of brown felt and make one end pointed. They can be different lengths and widths. Cut out two longer strips that will hold the gate together. Make the gate as long or as short as you’d like. Step 5: Assemble pumpkins and gate usually hot glue. Burn your fingers multiple times – don’t fight it; it’s inevitable. Don’t panic when your gate looks like it’s been through a windstorm. This gives it character (right?). 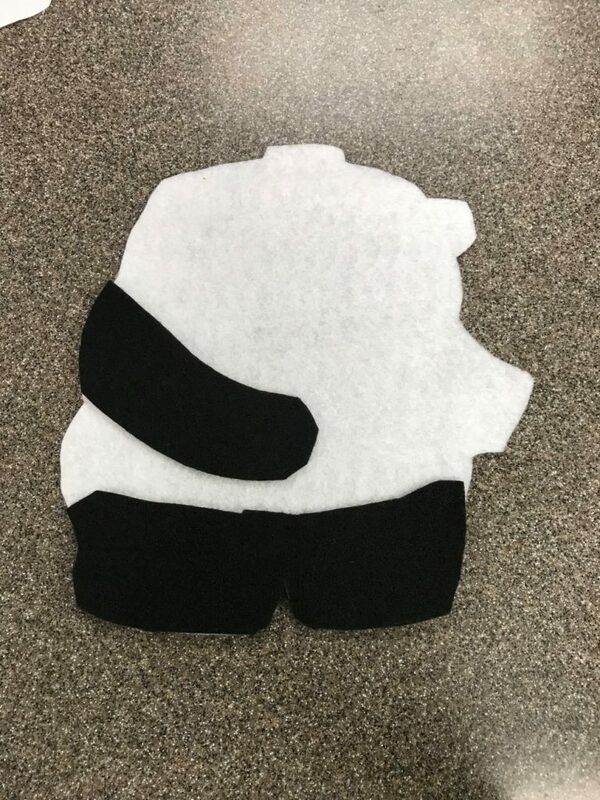 Step 6: Use in storytime! 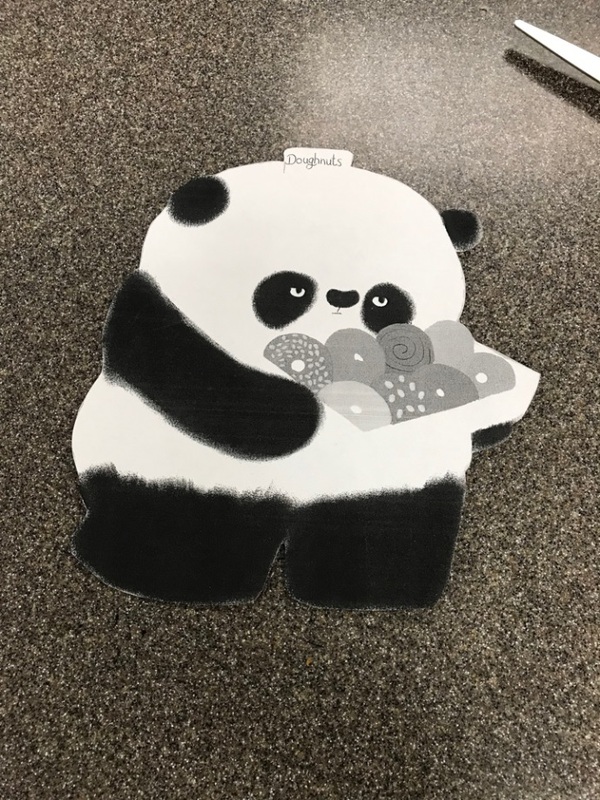 Thank you to Kathryn at Fun with Friends at Storytime for hosting this week’s Flannel Friday round-up. I love the Flannel Friday community. When I first moved to Vancouver I was a little surprised that most people don’t have screens on their doors or windows. I didn’t think too much of it until one day I was relaxing on the couch when a squirrel ran into my living room! It jumped from a tree, onto my balcony, and straight into my apartment. We stared at each other for about five seconds before it bolted back out the door. It’s safe to say that since that day I’ve put up a hanging screen on my balcony door. Despite the little rascal that ended up in my home, squirrels are curious and cute critters that most kids recognize. Dana taught me this super fun chant to sing when your storytime kids need to get up and move around. 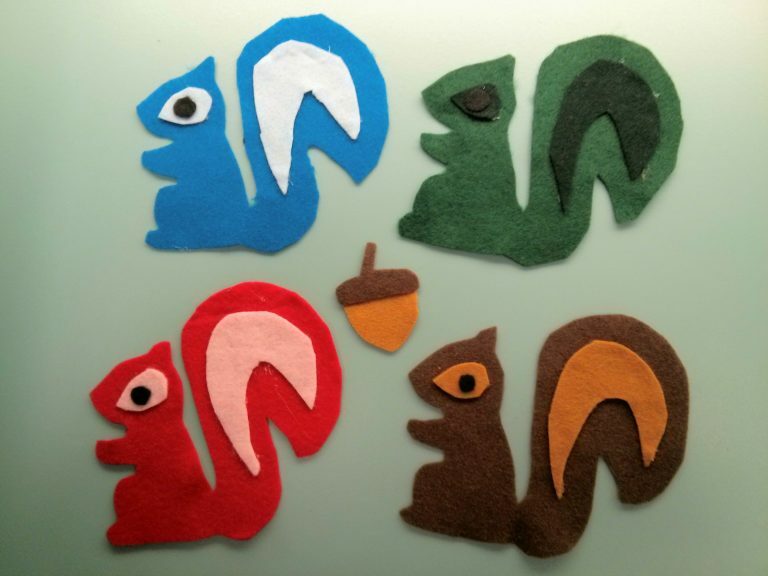 I love doing it with scarves – you can ask kids what colour scarf they are holding and then change the squirrel to that colour. Dana also discovered the delight that comes from putting the scarf in your back pocket and shaking it like a tail. 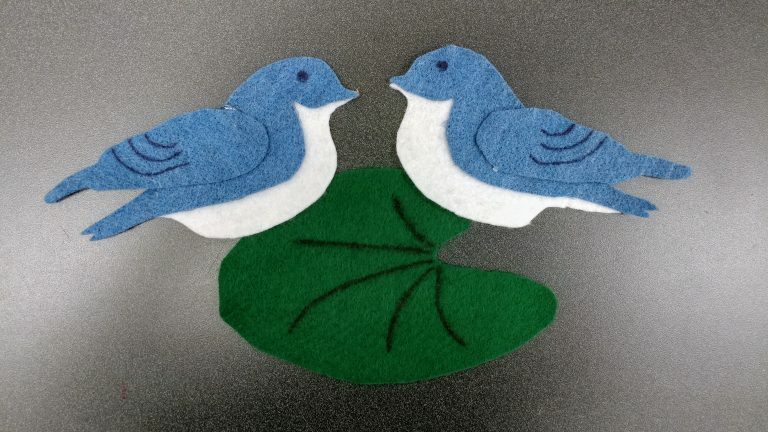 Thank you Kate at Felt Board Magic for hosting this week’s Flannel Friday round-up. Learn more about the Flannel Friday community and how to participate.